Manolo’s Restaurant 42-26 Greenpoint Ave. Queens, NY 11104 (Sunnyside) 718-383-1110 corner of 47th Street and Greenpoint Ave.
Back in Queens yo, and Manolo’s is definitely representing. I’ll admit from the look of Manolo’s exterior I was a bit apprehensive about going in; I thought this was going to be another faux Mexican experience. I was pleasantly surprised to find they serve caldo de res (beef soup), huaraches, quesadillas, tostadas, chicken pipián (pumpkin seed sauce), mole enchiladas, and of course tacos. Now, lets get down to business. I ordered a steak and lengua taco. How are the tacos? Good, tortilla was not too dry and not too greasy. They add a little guacamole to each taco, reminded me of Tacos Xochimilco in Sunset Park; the guacamole is always a nice touch. The steak was nicely chopped and moist, I couldn’t tell what kind of cut of meat they use. Regarding the lengua taco, I am very picky with this taco and it was okay, nothing outstanding but okay. I don’t think Poblanos are known for their tacos de lengua. - Price: Tacos are $2.50 each. - Directions: Take the 7 train to 46th street, walk to 47th street and make a right, walk one block. - Open from 11am to midnight everyday. You know you want to see this! Barrio's inaugural event is happening this Thursday, March 18th starting at 7pm. What's at stake here, besides pride and honor, there's a $100 gift certificate. Details are below. Tacos served: It's a surprise but a vegetarian option is available if the contestant lets them know in advance. When: This Thursday, March 18th, 7pm (sign up now). The owners of this taqueria hail from Mexico City and they strived to serve street style tacos a la Mexico City, and their presentation nails it. Not your typical taqueria, the place is adorn with images of Mexican wrestling icons, they stay true to my own philosophy of “naco es chido,” which can be interpreted as trashy kitsch is cool. The ambience as Mrs. Tizoc Schwartz (aka Xochitl Goldberg) puts it, is “cute.” They’ve really paid attention to detail. And now for the food, their steak taco is good but the thing to get here is their three-taco-plate, I went with “El Santo,” named after the godfather of modern Mexican wrestling. El Santo is three different types of meat, cecina, chorizo, and chicharrón; it is definitely worthy of its prize fighting name. I inhaled all three tacos in less than 3 minutes and washed it down with some horchata. Oh, leave room for dessert, we went with a slice of tres leches cake, it’s sooooooo good I thought I was on crack! 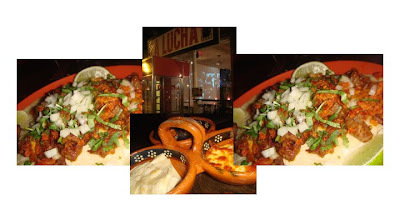 La Lucha is located on Avenue A between 9th and 10th, across the street from Tompkins Square Park. During weekends they are open for brunch and they serve chilaquiles and pozole!!!! !